This April, Commit to Just Driving. Say ‘No’ to Distracted Driving. There’s one message local and federal agencies are pushing this month as they kick-off Distracted Driving Awareness Month 2018 today: Just drive. It’s such a focal point that in 2016, a variety of public and private groups, as well as state and federal organizations, banded together to form the Road to Zero Coalition, a coordinated, data-driven response to the increase in roadway deaths. Since October 2016, more than 450 organizations, individuals and companies have joined the coalition. According to the NSC, due to the number of motor vehicle collisions in 2017, more than 4.5 million people required medical attention as a result of their incident, which cost the public nearly $414 billion. In all, 40,100 people died in 2017 in motor vehicle crashes. Many local enforcement agencies across the U.S. have announced plans to target distracted drivers in the coming weeks. Marvin Mailey, Deputy Chief of Police of the City of Dover Police Department in Maryland, said he’s asked his officers to focus their enforcement efforts on distracted driving violations and seat belt violations this month. Over on the West Coast, the Washington Traffic Safety Commission (WTSC) has announced that the Washington State Patrol will increase its presence on roads this month, specifically April 2-14, in search of drivers who can’t keep their eyes off their phones. The state recently passed its new “Driving Under the Influence of Electronics” (E-DUI) law, which bans drivers from holding cell phones or watching videos while they are driving, stopped in traffic, or at a stop light. The law restricts hands-free use to a single touch. Nearly 1,500 drivers have been ticketed each month since Washington’s new E-DUI law went into effect in July 2017. Practice defensive driving. Buckle up, designate a sober driver, or arrange for alternative transportation ahead of time. Be sure to get enough sleep to avoid fatigue and drive attentively. Recognize the dangers of drugged driving. This includes impairment from prescription opioids and marijuana use. Visit www.stopeverydaykillers.org to learn more. Fix recalls immediately. See if your vehicle is currently under a recall by visiting www.checktoprotect.org. 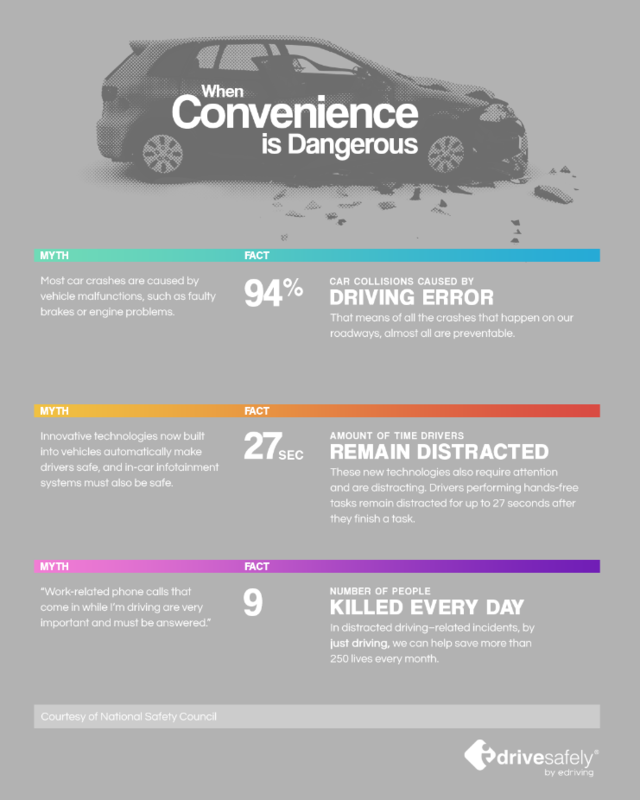 Stay engaged in teens’ driving habits. Read our story, “Parents: Tools to help your teen resist using their phones,” on DriversEd.com. Ask lawmakers and state leaders to protect travelers on state roadways. The NSC’s State of Safety report shows which states have the strongest and weakest traffic safety laws. Join the Road to Zero Coalition. Help the NSC make roads safer for all of us. Learn how safety professionals are addressing motor vehicle fatalities by visiting nsc.org/roadtozero to get involved. This April, commit to saying “no” to distractions – don’t answer that work call, or reply to that text, or check your newsfeed on Twitter. 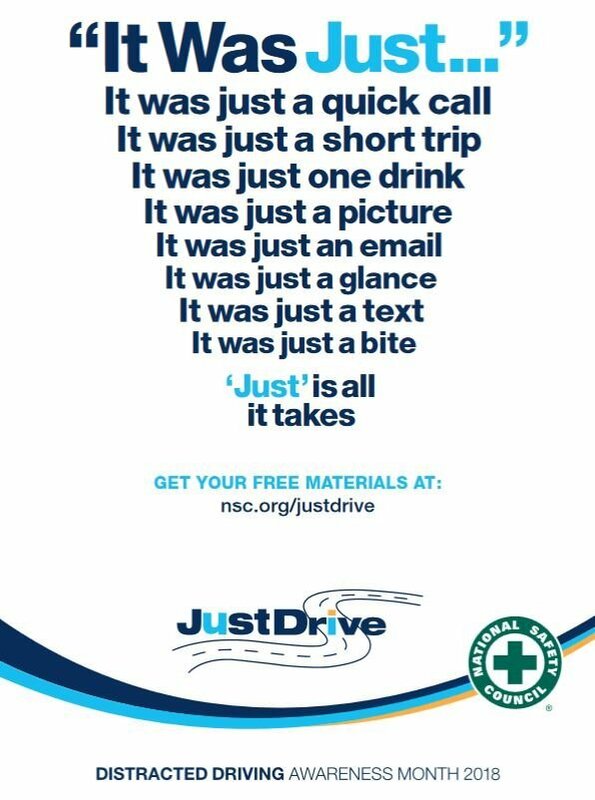 Just drive.